Definition at line 122 of file MCStreamer.h. Definition at line 29 of file ARMTargetStreamer.cpp. Callback used to implement the ldr= pseudo. Add a new entry to the constant pool for the current section and return an MCExpr that can be used to refer to the constant pool location. Definition at line 36 of file ARMTargetStreamer.cpp. Definition at line 116 of file ARMTargetStreamer.cpp. Definition at line 110 of file ARMTargetStreamer.cpp. Definition at line 111 of file ARMTargetStreamer.cpp. Definition at line 104 of file ARMTargetStreamer.cpp. Referenced by checkFunctionsAttributeConsistency(), llvm::ARMAsmPrinter::EmitEndOfAsmFile(), and emitTargetAttributes(). Definition at line 90 of file ARMTargetStreamer.cpp. Callback used to implemnt the .ltorg directive. Emit contents of constant pool for the current section. 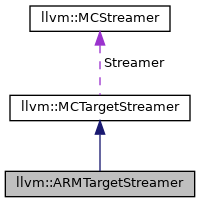 Definition at line 40 of file ARMTargetStreamer.cpp. Definition at line 89 of file ARMTargetStreamer.cpp. Definition at line 88 of file ARMTargetStreamer.cpp. Definition at line 113 of file ARMTargetStreamer.cpp. Definition at line 93 of file ARMTargetStreamer.cpp. Definition at line 51 of file ARMTargetStreamer.cpp. References llvm::MCStreamer::EmitBytes(), llvm::MCContext::getAsmInfo(), llvm::MCStreamer::getContext(), llvm::MCTargetStreamer::getStreamer(), I, llvm::ARM_PROC::IE, llvm::MCAsmInfo::isLittleEndian(), llvm_unreachable, and Size. Definition at line 107 of file ARMTargetStreamer.cpp. Definition at line 96 of file ARMTargetStreamer.cpp. Definition at line 112 of file ARMTargetStreamer.cpp. Definition at line 97 of file ARMTargetStreamer.cpp. Definition at line 91 of file ARMTargetStreamer.cpp. Definition at line 92 of file ARMTargetStreamer.cpp. Definition at line 98 of file ARMTargetStreamer.cpp. Definition at line 94 of file ARMTargetStreamer.cpp. Emit the build attributes that only depend on the hardware that we expect. Definition at line 160 of file ARMTargetStreamer.cpp. References llvm::ARMBuildAttrs::ABI_HardFP_use, llvm::ARMBuildAttrs::Advanced_SIMD_arch, llvm::ARM::AEK_HWDIVARM, llvm::ARM::AEK_HWDIVTHUMB, llvm::ARMBuildAttrs::AllowDIVExt, llvm::ARMBuildAttrs::Allowed, llvm::ARMBuildAttrs::AllowHPFP, llvm::ARMBuildAttrs::AllowMP, llvm::ARMBuildAttrs::AllowNeonARMv8, llvm::ARMBuildAttrs::AllowNeonARMv8_1a, llvm::ARMBuildAttrs::AllowThumb32, llvm::ARMBuildAttrs::AllowThumbDerived, llvm::ARMBuildAttrs::AllowTZ, llvm::ARMBuildAttrs::AllowTZVirtualization, llvm::ARMBuildAttrs::AllowVirtualization, llvm::ARMBuildAttrs::ApplicationProfile, llvm::ARMBuildAttrs::ARM_ISA_use, llvm::ARMBuildAttrs::CPU_arch, llvm::ARMBuildAttrs::CPU_arch_profile, llvm::ARMBuildAttrs::CPU_name, llvm::ARMBuildAttrs::CPU_unaligned_access, llvm::ARMBuildAttrs::DIV_use, llvm::ARMBuildAttrs::DSP_extension, emitArchExtension(), emitAttribute(), emitFPU(), emitTextAttribute(), llvm::StringRef::empty(), llvm::ARMBuildAttrs::FP_HP_extension, getArchForCPU(), llvm::MCSubtargetInfo::getCPU(), llvm::ARMBuildAttrs::HardFPSinglePrecision, llvm::MCSubtargetInfo::hasFeature(), isV8M(), llvm::ARMBuildAttrs::MicroControllerProfile, llvm::ARMBuildAttrs::MPextension_use, llvm::ARMBuildAttrs::Not_Allowed, llvm::ARMBuildAttrs::RealTimeProfile, llvm::StringRef::startswith(), switchVendor(), llvm::ARMBuildAttrs::THUMB_ISA_use, and llvm::ARMBuildAttrs::Virtualization_use. Definition at line 105 of file ARMTargetStreamer.cpp. Referenced by checkFunctionsAttributeConsistency(), and emitTargetAttributes(). Definition at line 117 of file ARMTargetStreamer.cpp. Definition at line 100 of file ARMTargetStreamer.cpp. Definition at line 46 of file ARMTargetStreamer.cpp. Definition at line 114 of file ARMTargetStreamer.cpp. Referenced by llvm::ARMAsmPrinter::EmitEndOfAsmFile(), and GetAEABIUnwindPersonalityName(). Reset any state between object emissions, i.e. the equivalent of MCStreamer's reset method. Definition at line 49 of file ARMTargetStreamer.cpp. Definition at line 103 of file ARMTargetStreamer.cpp.